Corsair's new inverted-ATX PC cases, the 600Q and 600C, put your main heat generating components directly in the airflow of its three big fans. To be clear, in an inverted-ATX case, your motherboard mounts upside-down from its usual orientation. 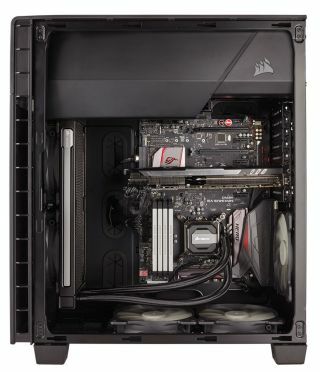 Corsair says its first attempt at inverted cases create a high-airflow, low-noise interior that'll keep your PC running at a nice low temperature. The three AF140L fans that come with the cases, two for intake and one for exhaust, are placed at the bottom and the back of the case, and they come with a controller than allow you to reduce the RPM for an even quieter PC. You'll be getting a PSU and 5.25-inch bay cover which you can hide your cables behind. There's also room in the cases for up to a 280mm radiator up front, or a 360mm radiator on the bottom for water cooling. Both cases come with eight expansion slots, two 5.25-inch drive bays, two 3.5-inch hard drive bays, and three 2.5-inch drive bays. There's also room for either two 140mm fans or three 120mm fans on the bottom if you want to change up the air cooling. The 600Q comes with extra sound dampening throughout the side, front, and top panels. Meanwhile the 600C comes with a hinged and latched full side panel window. Other than that they're identical, so you're choosing between the extra quiet Q, or the ability to see your components with the C. Both cost $150 and are available from Corsair's website now (600Q, 600C).